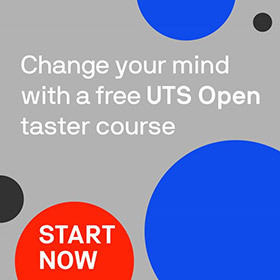 As a member of the UTS community, we’d like to share with you our new strategy – UTS 2027 – which defines our vision for the next nine years. You may recall I contacted you in June with an invitation to participate. Thank you very much to all who contributed to our ideas platform. You played an important role in helping us create a plan that reflects the perspectives, commitments and priorities of the broad UTS community, and responds to the dynamic times we face. We have published the full strategy online, but below is an overview and some detail on the aspects that we believe will be of most value and interest to our alumni community. Our strategy is much more than a piece of paper. It is a living, breathing strategy and as we progress, we will be sharing stories of our success and further initiatives on the website. Explore strategy.uts.edu.au for more about UTS 2027. We will be a leading public university of technology recognised for our global impact. Our purpose is to advance knowledge and learning through research-inspired teaching, research with impact and partnerships with industry, the professions and community as we embrace a ‘lifetime of learning’ mindset. Critical to the success of the strategy will be our ability to seamlessly partner and play to our distinct and inherent strengths. But some things won’t change, like our commitment to social justice, accessibility, responsible leadership of technology and excellence in Indigenous higher education and research. A personal learning experience that is delivered in partnership with students and continues throughout their lives. Our flexible learning approach will ensure that all alumni and partners can access the programs and develop the skills they need, when they need it and using the delivery mode that suits them. We can only achieve our vision by collaboratively working in partnership with industries and communities. Using our expertise, partners will develop the skills that they need in their own workforce, which will, in turn, guide our research, help deliver UTS services, and shape our learning experience. Leveraging our world-class city campus and prime position within the heart of Sydney's creative/digital industries and startup community, we'll be recognised as Australia's leading university in innovation and entrepreneurship. We will deliver research with impact that will be exemplified by excellence, engagement with global partners, and innovative collaborations that transcend disciplinary and professional boundaries. We will continue to cultivate values in our students and staff that contribute to a sustainable future. We’ll strive for continual improvement in our sustainability outcomes and ensure best practise in our processes and systems, research, learning, campus operations and community collaboration. Visit strategy.uts.edu.au to explore the full UTS 2027 strategy.